This month the Cult Film Club is covering the 1985 cult classic, Return to Oz. Being the Ozphile of the hosts, I’ve read all 14 of the original L Frank Baum Oz books as well as some of the non-Baum Oz books. You can read my reviews of all of those books here. As I mentioned in the show, the movie does a good job of taking it’s visual cues from the books and specifically the John Neill drawings. The final coronation/parade sequence has a lot of character cameo Easter Eggs for fans of the books. 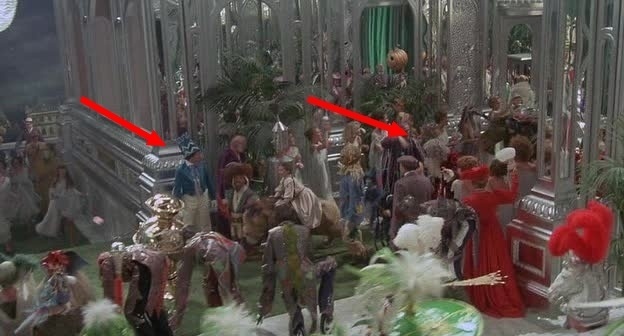 I thought I’d step through the final sequence in the movie and point out to you the hidden characters of Oz that the filmmakers placed into the movie as Easter Eggs. This was fun to do I hope you enjoy this deep dive into Oz nerdery. The green arrow on the left is pointing to a character known as The Braided Man. He first appeared in the fourth Oz book, Dorothy and the Wizard in Oz. He was a great inventor and lived on the side of Pyramid Mountain. Like many of Baum’s side characters, the Braided Man would show up at Ozma’s birthday party in The Road to Oz. The yellow arrow on the right is pointing to The Shaggy Man, wielder of the Love Magnet. He first appeared in The Road to Oz and would become a regular character in the following books. Would eventually get an Oz book named after him written by Jack Snow. This is Tommy Kwikstep. He’s a character from the twelfth Oz book, The Tin Woodsman of Oz. He was a munchkin who accidentally wished himself 20 legs. Unfortunately John Neill didn’t illustrate this character so there’s no source material which makes him hard to identify at face value but if you look at the below production photo you can clearly see the multiple legs. Tommy also showed up in an episode of the 1996 Oz Kids cartoon. This character is named Polychrome, the Rainbow’s daughter. Another character that debuted with The Shaggy Man in The Road to Oz. She is a magical sky fairy and is portrayed to be very ethereal but also very flighty. Here is a production photo of Polychrome that gives you a better look at the costume. Polychrome would show up in several later Oz sequels and even cross over into one of Baum’s non-Oz works, Sky Island. I originally thought this was Cap’n Bill. The character Cap’n Bill first shows up in two of Baum’s non-Oz books, The Sea Fairies and the sequel, Sky Island. He traveled around with a young girl named Trot. Considering how closely the filmmakers stayed with the other characters, this particular look is not in keeping with any of the visual depictions or descriptions of Cap’n Bill who is supposed to be an old, grizzled ex-sailor. I mainly identified him because of the sailor suit and the fact that he’s carrying the magic flower that he and Trot obtained for Ozma in the thirteenth book, Magic of Oz. However, from the back, this guy doesn’t seem to be old like Bill. And the sailor outfit isn’t of the style Bill wore, it’s one of those cutsey, childish ones. Bill wore a tattered old pea coat and sailor hat. That led me to believe this may actually be the character Button Bright who was a very childish character that did wear one of those types of sailor suits. Which makes the inclusion of the flower an odd choice because Button Bright had nothing to do with that magic flower. So, baffled, I searched around a little harder in the coronation sequence and I found a picture of this sailor guy from the front. Below is the screenshot. Bill is standing behind the Tin Woodsman in the center. You can see the magic flower. From the front, it looks like this character is made to look a little older with the gray beard. So maybe this is, in fact, Cap’n Bill. I thought the guy above was Button Bright, and maybe he isn’t. But Button Bright is supposedly in the movie. Doing a bit of research, it looks like people are pointing to a small child in a gold outfit as Button Bright. He’s standing under the Gump head during the Scarecrow’s coronation. I never caught this one until I saw the pics on the Internet. I guess so. But then, again, that makes the Cap’n Bill representation not match up to the Neill drawings which had been so closely followed until now. If that boy in gold is Button Bright, it’s a pretty faithful adaptation and Cap’n Bill is not which is baffling to me. The general consensus is that this clown character is Notta Bit More from Ruth Plumly-Thompson’s The Cowardly Lion of Oz. However, I feel you could make a similar case for it being Flippityflop, the king of Clown Valley in Baum’s Dot and Tot of Merryland. Technically Flippityflop does not make an appearance in an Oz book, but the Queen of Merryland does and that book was written by Baum and illustrated by WW Denslow, the original Oz illustrator. But that may be a bit of a deep cut and it’s more than likely Notta Bit More. Or just a generic clown. 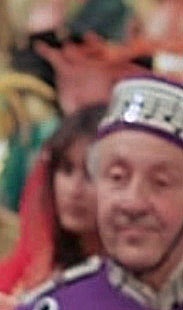 He can be seen quickly in the parade but he can also be seen better standing behind Tik-Tok in the coronation scene. This one was the hardest one to spot. There lurking in the back is The Frogman from the eleventh Oz book, The Lost Princess of Oz. I had never spotted him before but I knew he was in there somewhere because there’s a nice movie production still of the costume. Below is a nice grouping of characters from the coronation. It’s a production still, not a screenshot like the previous images. It’s the best look we get of several characters. On the far left with the white beard is the aforementioned Shaggy Man. Moving to the right the guy in the glasses wearing black and green I believe is supposed to be the Emerald City’s Guardian of the Gates who we see in the first book and in the 1939 movie played by Frank Morgan. He doesn’t look like Frank Morgan’s Guardian but check out the WW Denslow drawing of that character from the Oz Wiki. It looks just like him. To the right of the Guardian of the Gates is Scraps, the Patchwork Girl of Oz. She is a very popular character in the books and first appeared in the seventh Oz book, The Patchwork Girl of Oz. Below is a production still of the character (left) that better showcases the costume along with the original John Neill drawing of the character (right). It’s pretty amazing how faithful many of these costumes are to the original book illustrations. It definitely ups my respect for the production of this movie. I’m not sure who the old man is next to Scraps. He’s wearing a weird crown on his head, so he must be a king of some sort but I’m not sure whom. It doesn’t seem the Internet has identified him either. Next to the old king is a dude in a baker’s outfit. For the longest time I had no idea who that was. Then it finally hit me, that is the Bumpy Man. 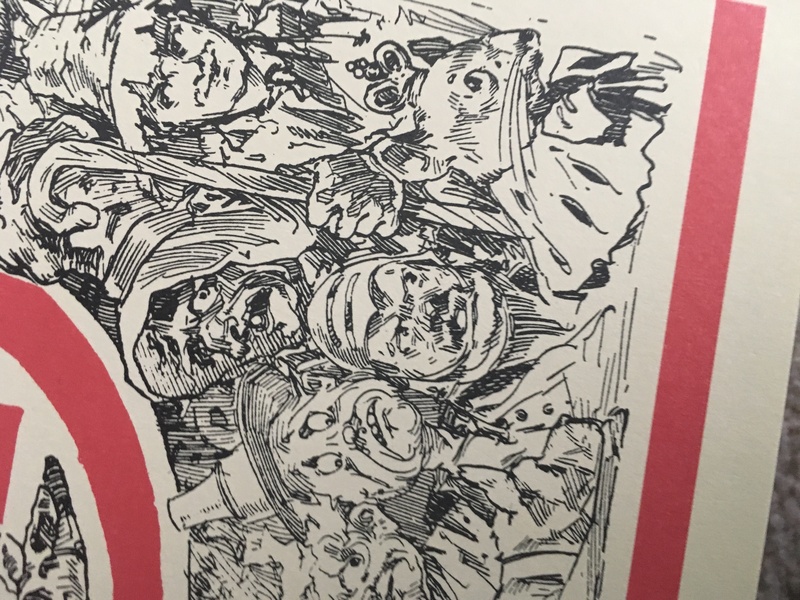 You’ll notice a lot of Baum characters are named based on their physical appearance (Shaggy Man, Braided Man, Frogman, etc). He is from the ninth Oz book Scarecrow of Oz and specialized in serving molasses and sugar which explains why he’s dressed up like a baker. I feel like this lady in white is supposed to be a character as well but I can’t really put my finger on it. Maybe she’s the aforementioned Queen of Merryland who was supposed to be a living wax doll. She doesn’t necessarily look like the Denslow illustrations of that character. But she’s placed so specifically and shown several times that I feel like she’s a character but I don’t know whom. Now, to finish up this article (don’t worry, it’s almost over) I have two characters that are supposed to be in this movie but I’ve never found. First up, Santa Claus. Baum is well known for writing a Santa Claus fantasy book called The Life and Adventures of Santa Claus. Santa even showed up at Ozma’s birthday celebration in The Road to Oz. So it doesn’t surprise me that everyone is saying he shows up at the end of Return to Oz. But I haven’t seen him yet. If anyone knows where he shows up, send me a screenshot. Or tell me where he is. I feel like some people are confusing The Shaggy Man with Santa Claus since they are dressed similarly. The second person is Glinda. First of all, I have to ask where the hell was Glinda throughout the events of the movie? She’s the most powerful magic user in Oz, I’m supposed to believe she just didn’t help? At all? Not even a mention that she was locked up somewhere and couldn’t help? Serious plot hole there. However, many sources online say she was in the final parade, but if she is, I’m not sure which person she is. No one is obviously Glinda the Good. Cult Film Club Episode 7: Mortal Kombat! First of all, Rinkitik! Holy crap how did I not make that connection? That’s totally King Rinkitik. Thank you Matthew, that completely escaped me. The guy on the far left next to Guardian of the Gates is Shaggy Man. I pointed to him earlier in the article next to the Braided Man. He just shows up again in that production still. Unfortunately I think that’s where everyone is getting confused. The filmmakers dressed him in the red and white colors of Santa Claus when they should have put him in green or blue. With that white beard and hair he already looks like Santa anyway. Santa as depicted in the original Baum book drawn by Mary Cowles Clark was big and rotund. When he showed up again in Road to Oz he was also a larger man. And he wore a distinctive beanie cap that I feel the filmmakers would have included considering they went to so much trouble to faithfully depict all these other background characters. Also, nice catch on Betsy Bobbin. I couldn’t get a good enough look at the girl to “confirm” it’s Betsy, but I wouldn’t be surprised if it is. I also saw cayke beside the frogman with. It’s definitely her she has a spoon. And all the women in white might be cloud fairys. Good eye. Missed that one too. I think you’re absolutely right about the cloud fairies. Hmmm, interesting but I honestly think that’s Shaggy Man again. What’s also interesting is that the Shaggy Man wig in the production still with Patchwork Girl and Bumpy Man looks a little different than the wig in the parade and coronation sequences. In the movie it’s a little more full with a little bit more gray in it. The production still version is a little whiter. Maybe the lighting is different. Maybe it’s a different day of shooting and the wig was styled a little different. I don’t know. I still feel like if they meant it to be Santa, they would have put the beanie cap on him since that cap is present in almost every illustration of Santa done for a Baum book. And especially in the main illustration they would have referred to from Road to Oz. Btw, Matthew, I love that you are searching this hard for Santa. I honestly thank you for this dedication. The guy next to the Guardian has different hair than the Shaggy Man shown above that, and is holding presents. Discrepancies aside, I’m pretty sure that’s Santa. Also, IMDB’s trivia entries say Wogglebug is in there, but I can’t find him. My best guess is the fella on the far right of that production still with the tall hat and long mustaches. You make a valid point. I’m not discounting that it’s Santa. Honestly, the presents barely registered. I thought they may have been gifts for the coronation. That may in fact be Santa, but that comes off as an uncharacteristically lazy interpretation compared to the other characters that were realized. First of all, that’s clearly the same actor as the Shaggy Man. And he’s wearing the exact same shaggy coat with the white accents. I too noticed the wig difference, but I chalked it up to different days/different shots. Second, he looks nothing like the jolly fat Santa from either John Neill’s drawings in Road to Oz or Mary Clark’s drawings in Life and Adventures of Santa Claus. After seeing all these other characters realized in such a dramatically faithful way, using the same actor and costume and just giving him a new wig (or taking off a wig) and a stack of presents seems super lazy. But, you may be right. That may in fact be Santa. That’s odd if it is. I think you’re right about Woggle Bug. Now that I look at that picture I see the guy you’re talking about. I bet that’s him. Good eye. This post has made me appreciate the movie even more. The other kids are probably trot, Betsy etc.